You enjoy riding your motorcycle all summer long, hitting the road on those sunny days. There’s nothing like it. Then winter shows up. You’d still like to get out, but to do what? Ride, of course. Your favorite back roads are even better when no one else is riding them. And no matter where you live, those sunny days do make an appearance here and there, even in winter. With the right planning, you can enjoy a little spontaneous combustion and join the wall that will soon fill with the names of those who have taken up the Cabin Fever Challenge. Photo: The cabin shown above sports an awesome bay view and has its own restroom & shower inside, just like a motel room. From the Winter Solstice (12/21/12) to the Spring Equinox (3/19/13), watch the weather report. When a few days of sunshine appear, change your plans and book a cabin at any state park in the United States. While you’re there, take in a little ‘me’ time, or enjoy time with a few friends who have agreed to play along. When you get home, send us a few pics and a copy of your reservation confirmation. Just for that we’ll send you a Cabin Fever Challenge Certificate you can frame and claim all your own. Say what? You enjoyed it? We think you will, so watch the weather again and hit a few more before the equinox. Anyone who books two or more cabin stays during the three month period will be entered to win a $100 gift certificate to Gerbing’s Heated Clothing. Additional prizes will be awarded based on uniqueness such as most bookings, farthest booking from Seattle and so on. Cabin camping is a much simpler way for riders to tour than tent camping, especially in the winter. In the winter, cabin touring by motorcycle is much more doable on a whim, rather than attempting to book in the spring, summer and early fall, when availabilities are tough to come by. A rider can easily book into a cabin, yurt or platform tent (all acceptable) with short notice, although most reservation systems want you to book at least a day in advance. Some amenities may include a kitchenette, microwave and a fridge. Nearly all are heated. All facilities have bathrooms and showers within the state park, and a select few have them right in the cabin. Some you can cook in, others you have to cook outside on a provided picnic table. Most Northwest state parks with such rentals are open all year. This does vary state by state. Begin by consulting the state park website for your state. Be patient, the navigation isn’t always as intuitive as we’d like to see. Read about where the cabins, yurt and platform tent rentals are. Learn about the amenities for each, then book your cabin and go. On the rental sites, again you may need to be a little patient navigating your way through the process the first time. Special note if you’re booking in Washington, a Discover Pass is NOT required for an overnight rental. Yea! The contest is open to riders all across America and it’s free to play. There will be two gift certificates. One for Northwest players and one for players outside of Washington, Oregon and Idaho. Only bookings within state parks will be accepted. Players may stay in a cabin, yurt or platform tent. To play simply email a copy of your reservation confirmation, photos and story about your night at the cabin to sreditor@soundrider.com. Your name will then be added to a list of all the players on a special page that will be linked to the home page of Sound RIDER! Certificates will be produced and mailed out by 4/15/13. Additional winners will be named in the April issue of Sound RIDER! No bears, no mosquitoes, no crowds. See you on the road – SOON! 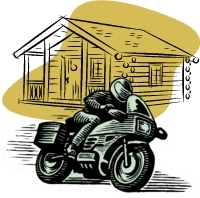 If you’ve never cabin toured on a motorcycle in the winter, we’ve created several lists and stories along with a few links that will assist you with preparation. See below. For other state parks, use a search engine typing in the state and state parks. Be certain you get the state site, not an imposter site like stateparks.com. Author's note. This article was written inside Cabin C1, at Kitsap Memorial State Park in Washington state along the Hood Canal Sunday afternoon, November 25, 2012. The other three cabins in the park were vacant that night. Happy hour ensued at 5 pm, dinner was at 6 pm and Tim Burton’s Dark Shadows was the night’s entertainment. This article was written, and the movie enjoyed - using a Microsoft Surface tablet.